An extremely fine and elegant wine from one of the great vineyards of Castiglione Falletto. The colour is carnet red with light orange coloured reflections. The nose is balanced and intense with violets, strawberries, prunes, cherries, mint, woody essence, liquorice and some balsamic notes. The taste begins slowly, but it grows incrementally until coating the palate. 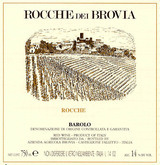 This wine can combine with every dish (except sweets) going particularly well with meat dishes and dry mature cheese.